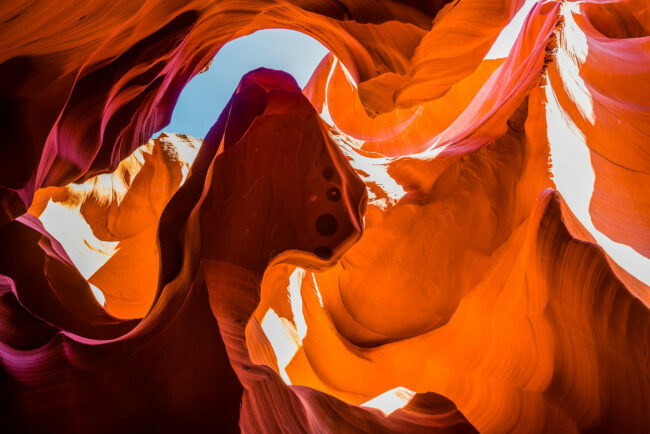 Directions: Lower Antelope Canyon like its more famous sister slot canyon is found in the Navajo Nation lands of Page, AZ. If you travel East on Route 98 from US Hwy 89, approximately 5 miles east you will see an intersection for Route 222. Head north on 222 and in about 1/2 mile you will take a sharp left hand turn (near U-turn) onto Indian Route 222 leading to a large dirt covered parking lot. 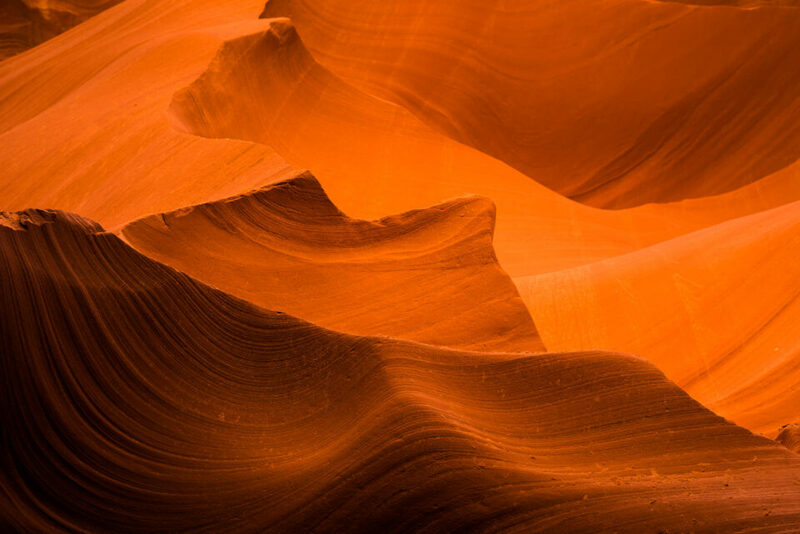 You will see two tour companies, one called Ken's Tours the other simply called Lower Antelope Canyon Tours. Do yourself a favor and go to the Lower Antelope Canyon Tours (on the left when facing the buildings). If you plan to shooting images to print, bring a tripod and an interchangeable lens camera and take the photography tour. 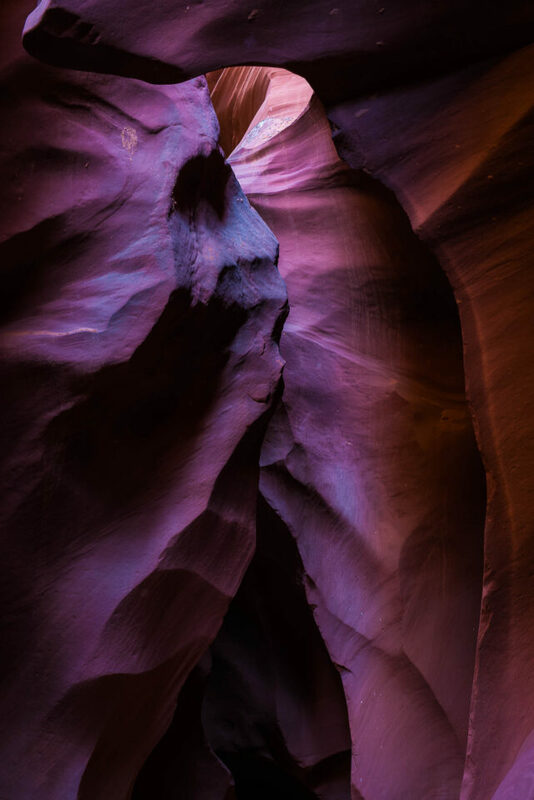 If you are taking a tour of the lower antelope canyon I highly recommend bringing sturdy tripod, a variety of lenses, and taking your time while on the photography tour. The extended tour as a photographer with a tripod and ILC body is totally worth the cost for a number of reasons. 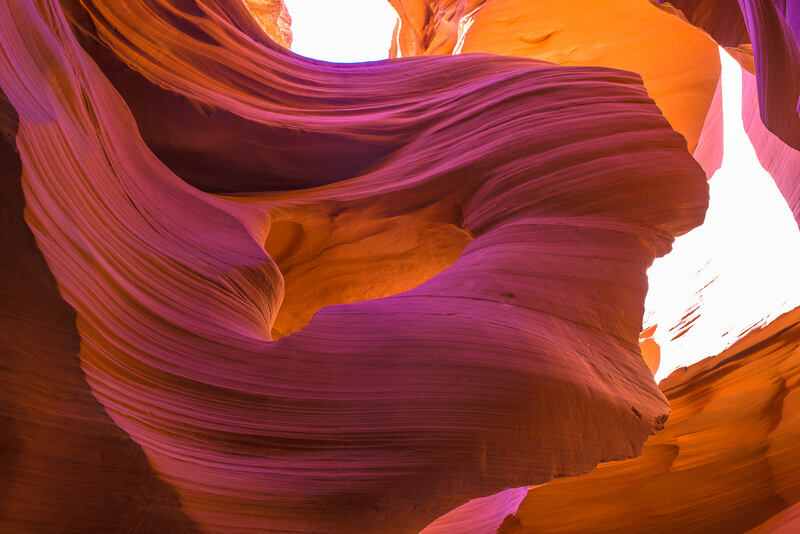 One, the tour guides are fantastic and give you great information about the slot canyon. Second, you spend nearly double the time in the canyon to explore and take pictures (approx 2 hrs compared to 1 hr on the standard tour). Lastly, the tripod is a must if you are shooting to print images big and only the photography tour allows a tripod in the canyon. 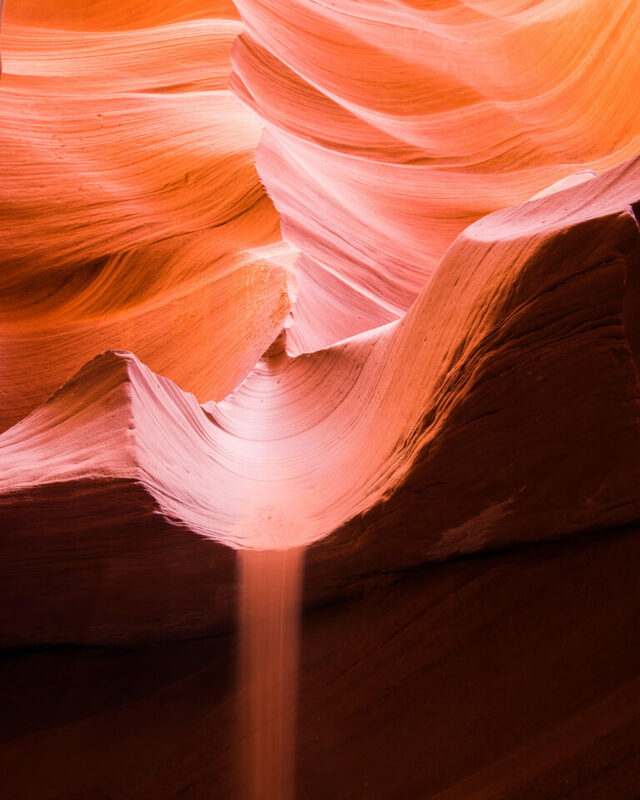 While many of the commonly photographed areas, as shown in the above two images, will be shown to you by every guide in the canyon, the real fun is that everyone’s interpretation, lens choice and post processing will give you vastly different interpretations of the same formations. 1. For light beams go to Upper Antelope Canyon (spring and summer months between 10-11AM) because high noon gives you the greatest sun beams. 2. Bring a tripod and spend the extra time and money on the photography tour. 3. If it can be avoided, do not change lenses often while in the canyon as dust is everywhere. 4. Buy/Bring a hand pump air blower for dust. 5. After your day here, carefully wipe down your equipment to remove rocks/dust/sand from behind focus rings, weather sealing rings and your bag. 6. If you have a significant other, they have to have a camera and tripod to also take the tour. If not they can not accompany you. You have been warned! 7. Experiment in your post processing program of choice. The color here is incredible. I will be in AZ the last two weeks in February and would love to take your photography tour. Please send me information. I’ve shot here many times… and long for the “old days”. Once upon a time this was a great place to shoot… but of late its a mess. The Navajo run this site and now the only way to get into it is to sign up for a tour. During certain times of the year they do have “photo” tours but they are not really anything special… the guide just holds the masses out of your shot for not more than 20 seconds so you can get a clean shot. You do not have the place to yourself on a photo tour… trust me on this. You are still in the canyon with many many people…. and the guides are pushing people through like cattle. Its a numbers game. They would be smarter if they would limit the number of people and raise the fees, thus, most likely making the same amount of money in the long run. But for now, it’s a volumn venue and most of the volume is coming from the buses… the same ones you see in monument valley, horseshoe bend and in the parking lot of the lodge at Waaweep. Mostly filled with Asian tourists (we love those Asian tourists don’t we?) If you are bent on getting these shots… go early and reserve your spot on-line or by phone. Unless you are hell bend on shooting the “beam” in upper antelope (remember, you need the sun high in the sky for this to be visible anyway… which happens around noon only certain times of the year), I’d suggest heading over to Canyon X as a possible option… its much less crowded. It’s hard to describe the number of people at antelope these days. Even after your “group” of 20 is called, you will still be waiting (most likely in the heat) for about 45 minutes (minimum) just to get down the steps into lower antelope. From there… its a cattle drive. Sure, it’s spectacular and unique… but not what you are imagining. This was once a treat… but like the lyrics in one of the Eagle’s old songs…”call some place paradise and kiss it goodbye. Canyon X??? Where is that?